Sand and Cement screed floors have been the preferred choice of the building industry for over 50 years. This type of screed is perfect for installing a floor that has a ‘fall’. In other words, a slight decline to help with drainage. Sand and cement traditional screed floors are more expensive but we always aim for the best quality, preferring factory mixed sand and cement floor screeds from large, reputable suppliers such as Lafarge, Tarmac, Aggregate Industries and Cemex. Using quality products allows us to guarantee the mix proportions of the screed, which in turn enables us to deliver a uniform, high-quality screed floor with a great finish. 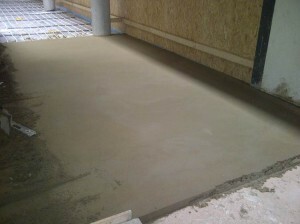 Traditionally, screed was specified as a mix ratio 4-1; that is 4 parts sand to one part cement. But standards have changed. Under the new British Standard BS EN 13813, screeds are now specified based on their performance. Simply specifying a 4:1 screed floor mix will not comply with the British Standard. Performance – this specifies a quick drying sand and cement mix. Strength – this is specified as a ‘C’ rating, with different rated mixes being ideal in various applications. Strength is specified from C16 to C30. Use and/or wear – this is classified as either light or heavy. Our team will be happy to help you choose the right screed floor mix for your project. Steel mesh has traditionally been used to prevent the screed from cracking but is proving expensive. Mesh is still used on occasion where certain specifications must be met but is dependent on application. Most manufacturers recommended polypropylene fibres as this reduces cost and speeds up installation. When can I walk on the Screed Floor? 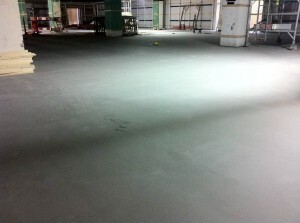 Most of our screeds can take light foot traffic after 4 days and site traffic after 7 days. But, as with all concrete flooring applications, we will advise you as to exact drying time of your concrete floor. Screed or concrete flooring should not be forced dried. This causes the moisture to evaporate too quickly, compromising the strength of the final flooring product. 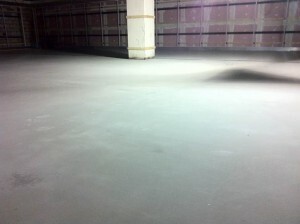 Screed dries out at rate of 1mm per day, with a thickness of 40mm. This drying time halves over this thickness, reducing to 0.5mm per day. However, new additives are regularly introduced to the market, all of which help to reduce drying times. As we are at the forefront of concrete technologies in the UK, we are aware of new products as they are launched and will use additives when they offer considerable benefits to our customers. Why Order Your Screed Floor Installation from Midland Flooring? With over 30 years of experience and a skilled, trained team, there is no better flooring solution company than Midland Flooring.